If you’re planning on shipping busses, cars, trucks, or any other drivable machinery, you don’t want to trust your vehicles with just anyone. And, you likely won’t want to have to find various carriers to meet your shipping needs. By choosing United States of Freight for your drive-away hauling, you’re choosing a forwarder with the industry experience to provide full-service drive-away solutions. This means that even before pick up to the actual delivery, we will take charge of everything that requires attention during the shipping process. Bus: Have a fleet of busses which need to go cross-country or brought to another state for repair? United States of Freight offers drive away services through carriers which understand your busess’ need for routine tire checks, cooling stops, and routine fluid examination. Get your busses to where they need safely and timely by leaving the specifics to us! Saddle Mount: This type of drive away service involves stacking vehicles on top of one another so that additional trailers don’t need to be utilized. Instead of having 4 drivers drive 4 trucks across country, saddle mount drive away allows one driver to transport 4 trucks at one time. So, this saves cost on wear, gas, and labor. Experienced drivers and decking experts are the only ones who can offer this service, which is why we’ve established business relationships with only the professionals in saddle mount drive away to offer our clients this option for their hauling needs. 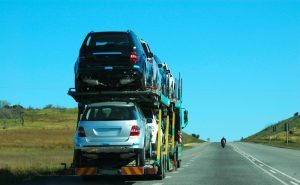 International: Have automobile equipment which needs transport overseas? We can help with the entire process, from pick up, drive away, ocean freight, to delivery. It can be stressful coming up with an entire plan to get automobile equipment to another country. Investing in a freight forwarding service like United States of Freight gives you the peace of mind in knowing the whole process is taken care of by industry professionals at a great price! Need drive away services for any of your mobile equipment? United States of Freight can help! Give us a call today at (888) 231-2833 to receive a free estimate on our drive away services.